Jason Wonder will build you a bike only if you promise you’re really going to ride it. And owner Ricky Powell enjoys his Wonder Customs Rev-2 to the max. 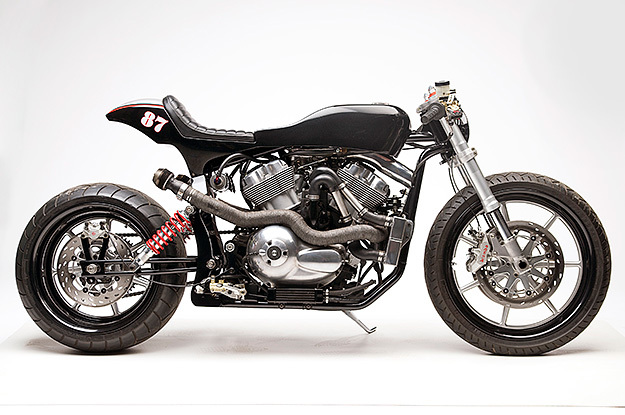 It’s a lithe concoction wrapped around a beefy V-Rod motor, and an excellent showcase for Wonder’s fabrication skills. There’s nothing that doesn’t contribute to going, turning or stopping. 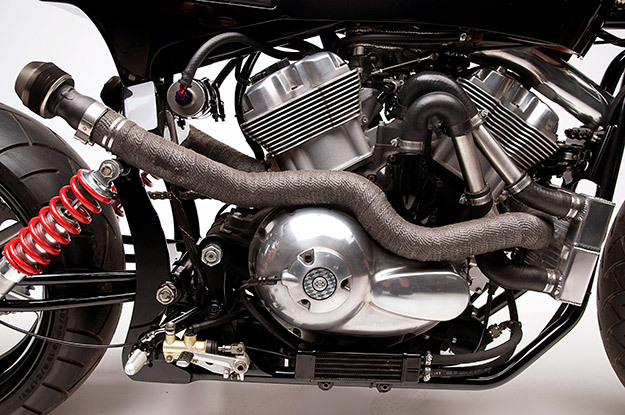 The fuel-injected 1130cc water-cooled V-Rod motor is fed by an external high-pressure pump and regulator mounted behind the hand-formed gas tank, with cooling handled by a custom radiator. Noise is kept to tolerable levels by a simple stack of diffuser discs at the end of each exhaust header; the engine can be tuned by adding or subtracting discs to complement the reprogrammed ECM. The motor internals were untouched—115 hp (86 kW) is enough for most folks—because Powell wants his machine to be rideable. 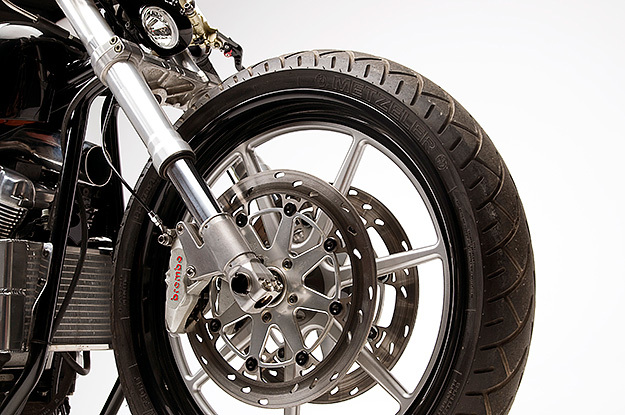 Showa forks and hand controls (pirated from a Ducati superbike) work well with the Works Performance rear shocks. And keeping everything under control are Brembo brakes attached to HogPro Daytona wheels, shod with Metzler 240/18 and 120/19 ME rubber. It’s a far cry from a bloated showbike, with the sinuous exhaust hugging the side of the engine and its curves reflected in the lines of that lovely tank. To my eyes, this is a textbook example of how to build a Harley custom. 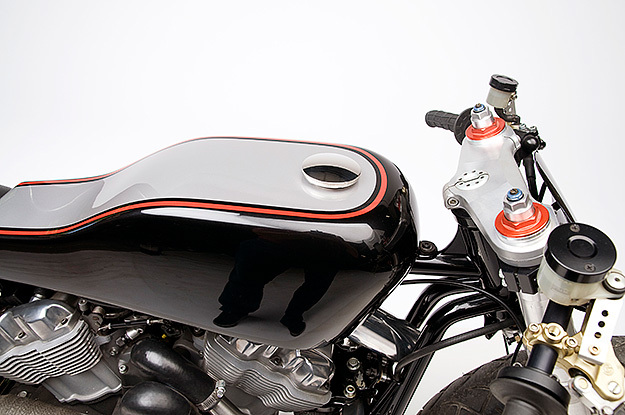 Britten: The “greatest motorcycle ever built”?